Way back in the mid-’70s, shortly after the introduction of the new Rabbit which would eventually become the Golf, someone at Volkswagen in Germany had the brilliant idea of making a sporty performance car out of the compact sedan, and the “hot hatchback” was born. The GTI took Europe by storm, and soon, all sorts of imitators were rushed into production to take advantage of the phenomenon. It didn’t take long for enthusiasts on this side of the ocean to begin clamoring for their own version of the GTI, and Canada saw the initial offering of the car in 1979, for only a couple of years. A few years later, in 1983, with the advent of U.S. production of the Rabbit, the Americans got their own GTI, and the rest, as they say, is history. Enter the sixth-generation GTI in 2010. 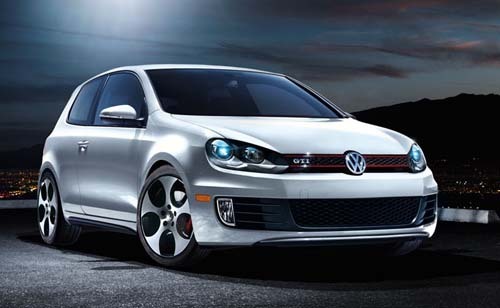 The new Golf GTI is an evolution of the last-generation car, which was known simply as the GTI. Mechanically, the new model is essentially the same, which is a good thing, given how much fun the last one was to drive. Under the hood is the familiar 2.0-litre turbocharged twin-cam four with direct injection, pumping out 200 horsepower and 207 lb-ft of torque from 1,700 to 5,000 rpm. This engine is the very definition of sporting, as it loves to be revved and worked hard. Taking the power from the engine is one of two transmissions, and, speaking as a died-in-the-wool manual transmission fan, this writer would have trouble choosing between the two. Standard is a slick-shifting six-speed manual box, while available is the now-famous six-speed twin-clutch Direct Shift Gearbox with paddle shifters, which delivers “right now” shifting either up or down, with no clutch pedal to worry about. A very difficult choice, but you can be assured that either way, the GTI is big fun to run up through the gears. If it makes your decision any easier, the DSG yields significantly lower fuel consumption in either city or highway use, and is 0.2 seconds quicker to 100 km/h to boot. Completing the running gear are a set of big disc brakes all around, electromechanical speed-sensitive steering, performance-tuned suspension that lowers the car 10 mm from the previous GTI, and 225/45R17 tires. Optional are 18-inch wheels that may not appeal to everyone. The newly sleek and muscular design of the Golf lends itself very nicely to the GTI, as it really looks the part of a performance car now. The front seats are a multi-adjustable sport design that will hold you in, no matter what. The air conditioning is the Climatronic dual-zone electronic system, and the Premium 8 audio system optional in Golf is standard in GTI. Coming with the Technology Package is an even more loaded infotainment set-up, with satellite navigation, 30gb hard drive, and Dynaudio 300-watt digital sound, as well as Media Device Interface. The new Golf GTI is certainly a worthy successor to a long line of previous hot hatchbacks that have entertained enthusiasts for three decades now. That idea Volkswagen had way back when has been proven to be a very good one, indeed.